Khayamiya: Khedival to Contemporary is the world’s first exhibition to reveal the story of the Egyptian Tentmakers from the Late Ottoman Empire to present-day Cairo. I am delighted to announce that this free exhibition will be shown in Wagga Wagga from Monday August 26 to Thursday September 12, 2013, in the HR Gallop Gallery (in Building 21 off Carpark 2), on the Charles Sturt University Campus, Wagga Wagga, New South Wales (Australia). It will be open from Monday to Friday during office hours – my apologies that it is not possible to open this exhibition during weekends as well. This exhibition has several purposes. 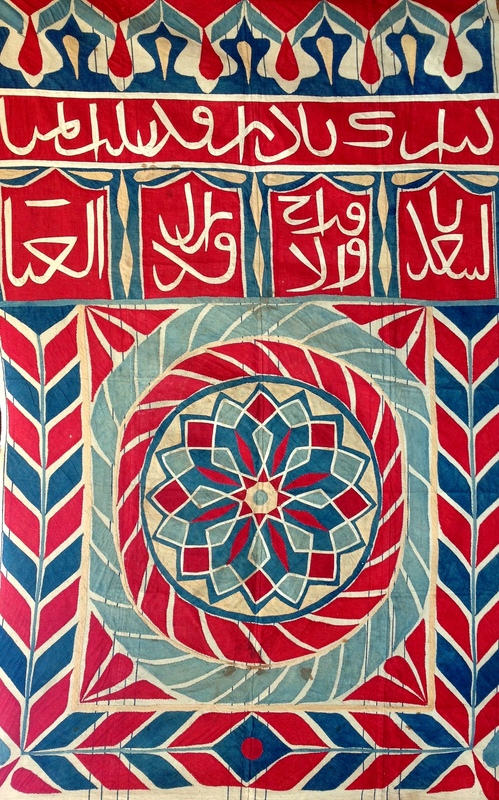 It is the first physical manifestation of my research into the art history of the Egyptian Tentmakers, and kicks off an ‘in-tents’ month of public lectures in the UK and Australia. It is also an experiment to test the feasibility of touring these textiles around Australia and internationally in 2014, as well as a great opportunity to document and study this world-class collection of very large antique Khayamiya. I curated this exhibition to cast Khayamiya within the rich historic context that this Egyptian art form deserves. By doing this, I hope to raise awareness of the Tentmakers of Cairo by embracing the unique visual and cultural heritage that has resulted in contemporary Egyptian Appliqué. Previous Tentmaker exhibitions have only featured their recent work, partly because until now, that was all that could be accessed for display. After extensive primary research, this situation has changed. This exhibition will prove that further research into the history of Khayamiya is justified, valuable, and fascinating. For every question it answers, new questions are raised. If you would like to know more, you are most welcome to join in a public conversation to be held inside the exhibition from 1pm on Tuesday August 27, 2013. This sounds like such an amazing exhibition , I really hope it is able to travel around Australia. Thank you very much Rachael – I would be very happy to see that happen! If you know of any galleries that can display antique textiles 3m high, then I would be indebted if you could let them know about this exhibition. Photographs of the installation will be uploaded next week. Thank you Lesley, I’m pleased you enjoyed it!